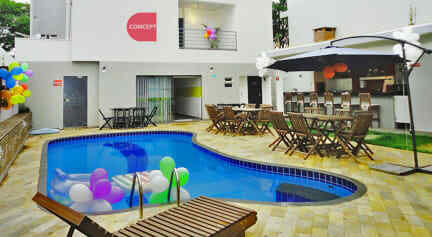 The Concept Design Hostel is the only Hostel Design in Foz de Iguazu, Land of Waterfalls, introducing a new concept of Hostel. With its eco-sustainable architecture and modern decoration, offers greater comfort to the guests who come from all over the world. Trilingual receptionists and Wi-Fi in all areas of the hostel. The common space used by all and provides an optimal sharing new experiences of harmony and friendship between our travelers trademark. It has cable TV and reading room, a gourmet kitchen available to guests, swimming pool and bar with typical Brazilian drinks and various parts of the world, theme parties around the pool with an extensive library of music that prepare our guests for the night life of the Triple Frontier. Spacious, comfortable, well decorated and with high quality rooms. It has beds with foam mattresses and bedding culled typical four-star hotels, a differential between Foz do Iguacu Hostels, plus lamps and individual outlets at the head of the beds and lockers. Using public transport, we are 25 minutes from the International Terminal and 15 minutes from Foz do Iguaçu Airport, 18 minutes from the Falls and just 10 minutes walk from the main bars and pubs of the city. Sightseeing packages in the region are sold at the reception.